Hey guys..I know I have been missing in action on the blog front. But offline, I have been trying out some amazing products. So, stay tuned for a number of product review posts. Today's post is about a Hair product I recently tried. My last post on how I controlled my post partum hair loss turned out to be quite popular, as I saw many a readers sharing it on their social media platforms. Today's post is a continuation of the hair care routine post pregnancy. Yes, I was able to control my postpartum hair loss quite well. But what after that? Well, my hair is not the same as it used to be. It has turned dry, frizzy and I do experience the regular hairfall issue as well. A few weeks ago, I got to use a product I had heard a lot about. 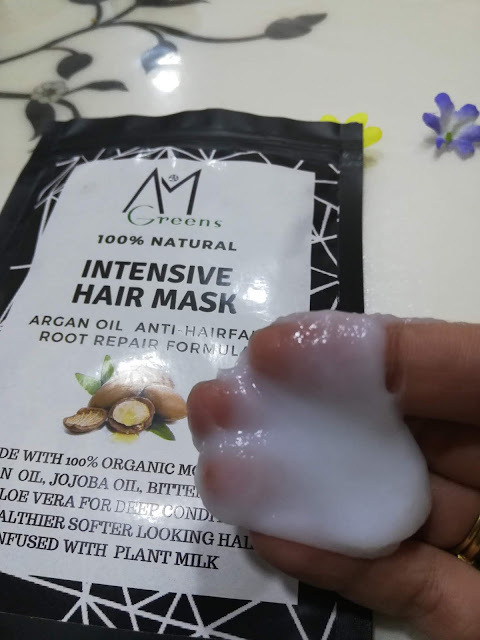 Its the AM Greens Hair Mask which is available at Euphorbia Box. 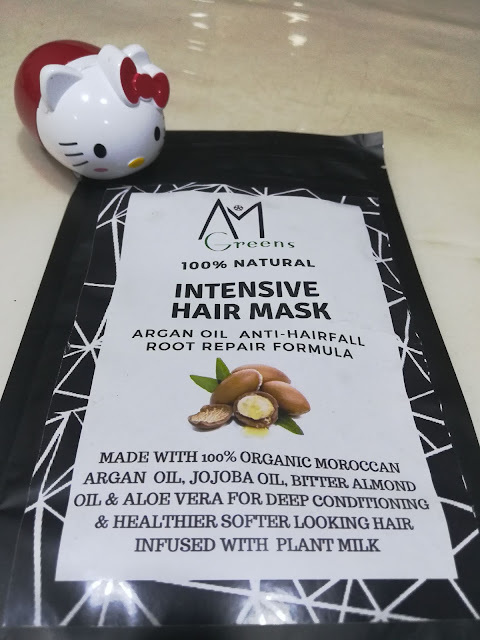 What I like about this product is that it is 100% natural and the long list of its awesome ingredients which include Organic Moroccan Argan Oil, Jojoba oil, Bitter Almond oil, aloe vera and other good stuff. The product claims to help repair the damage and combat hairfall. This product looks like a conditioner. It has to be applied to the roots of well combed hair and then comb the hair from root to tip post application. This mask has to be left in the hair overnight and then has to be washed off with a gentle shampoo. I have medium length hair, and this 100 gm mask last me for 2 applications. After the application, I thought I would have to wear a shower cap while sleeping. 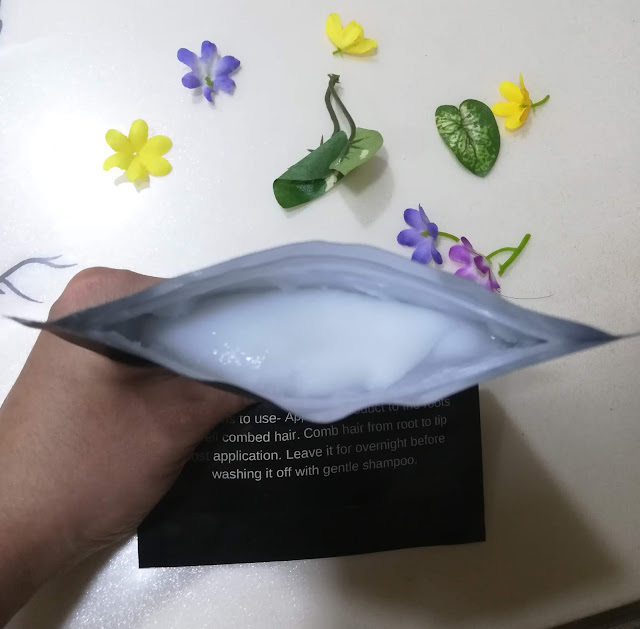 But the product did not leave the hair wet or sticky and absorbed really well. The next day, I washed my hair with regular shampoo. Surprisingly, my hair fall during the wash was minimal, but I thought it could just be a co-incidence. After I air dried my hair, my hair felt smooth. But they were still the regular dry and frizzy self. The following week, I experienced lesser hairfall, but it wasn't drastic. A week later I repeated the application. And when I washed my hair, my hairfall had size-ably reduced. And post drying my hair felt better. Since this is a natural product, I don't think you will see instant results. But I am slowly seeing results after each application. Hair loss is minimal and my hair texture seems to be getting better with every application. I think its a must try if you are looking for a good long term hair care routine. For a price tag of Rs. 99, I think its a complete steal and worth a try. 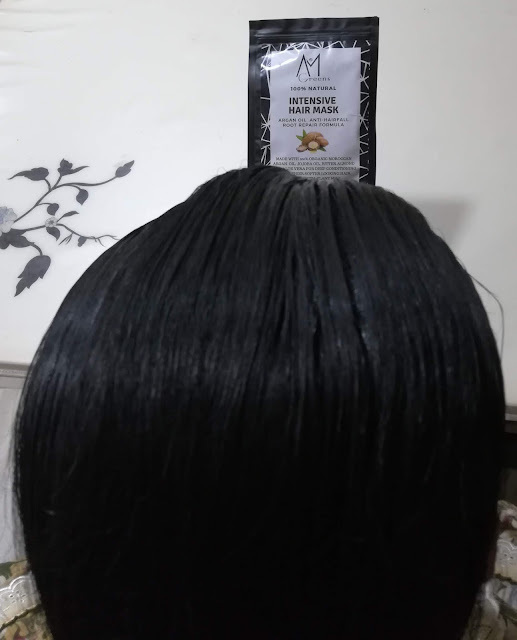 I'm really thankful to get the information about hair mask. Thanks for sharing details here.